Vorunthaal is a singleplayer dungeon level for The Elder Scrolls V: Skyrim that provides approximately 20-30 minutes of new gameplay. 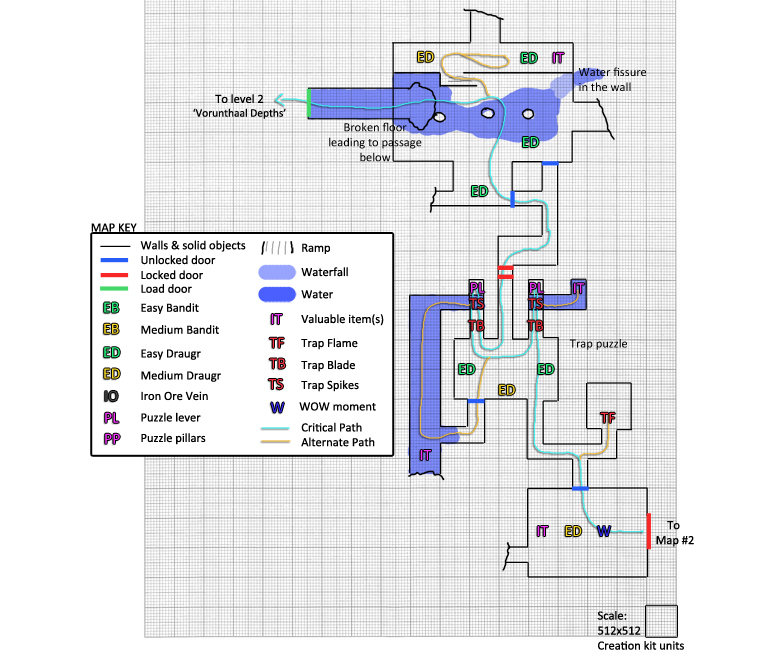 Vorunthaal is comprised of two explorable dungeon areas; the Vorunthaal Chambers (this level) and the Vorunthaal Depths. The dungeon is an ancient city that has sunken into an underground lake. A bandit clan, whilst mining for ebony, has uncovered the entrance to this large underground environment. The Dragonborn (player) must fight their way through the bandit excavation, explore the sunken ruins and encounter the restless draugr to uncover the secrets of this once great city. With Vorunthaal I aimed to create an experience that was different from many other Skyrim dungeons, I wanted to create an area that felt unique yet still fit within the style of the world. Underwater exploration and gameplay was one area of the original game that I thought could be expanded upon. This became one of the main focuses of the design. Water-breathing potions and spells form part of the essential gameplay in Vorunthaal as the player must swim through the sunken sections of the level. Provide compelling environmental challenges and incorporate underwater gameplay into the level design. Carefully control pacing by alternating between puzzle/exploration and combat scenarios. Create satisfying and varied combat encounters; multiple enemy types, ranges and environment factors. Create an ambient narrative through journals and visual storytelling techniques. 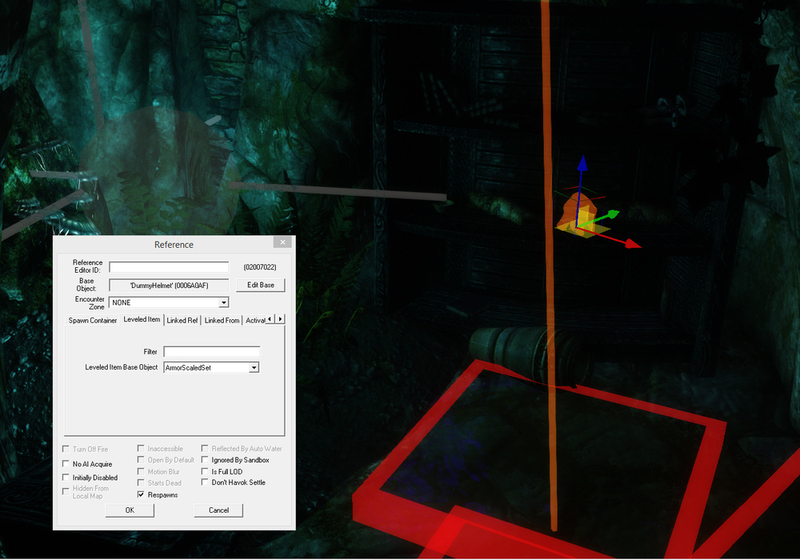 Vorunthaal tries to capture a different feeling from the many other areas in Skyrim with its focus on underwater exploration combined with puzzle-solving. To progress through the ruins the player will need to make use of water-breathing potions found around the environment and solve multiple puzzles, some of which are completely submerged. With a balance of exploration and combat the overall pacing is kept unpredictable and keeps the player on their toes. Fights can be unexpected because of the downtime between them, in this way the level demands attention from players. With Vorunthaal Chambers I began work on the structure for Area 1: The Mine first. 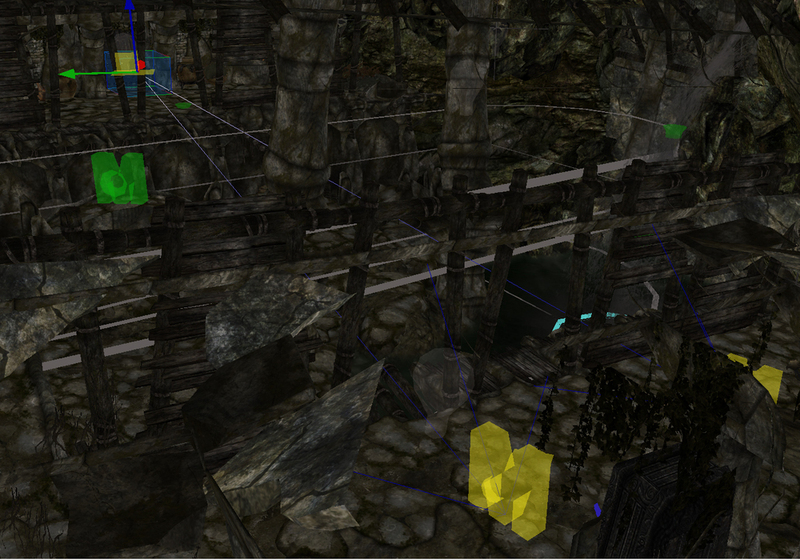 Since the Creation Kit uses modular pieces it was a fairly quick process to get this area blocked out. 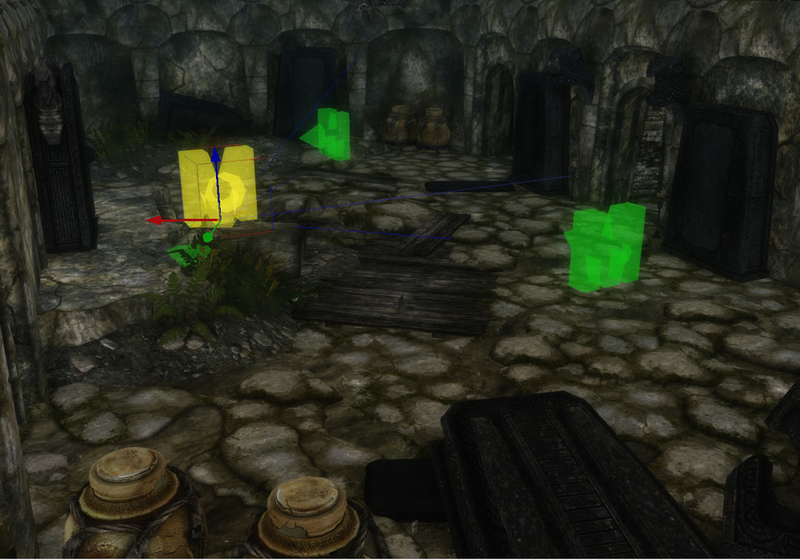 As I was finishing the block out of Area 1, I started to add some rudimentary enemy placements. This helped me get a feel for the spaces, and how it felt to approach an encounter within them. 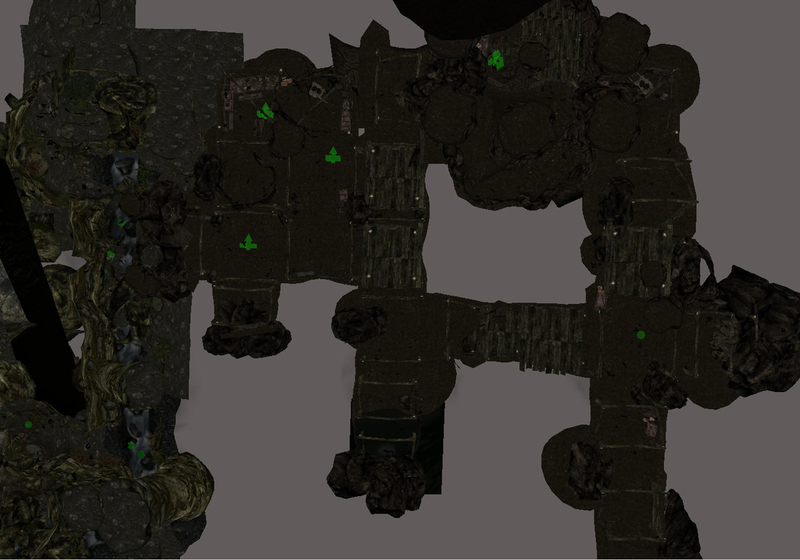 Next I added the connecting caves that lead the player from the mines to the large underwater ruins. Here I focussed on the "reveal" where the player steps around a corner and suddenly enters the ruins - I really wanted to push this WOW moment as much as possible. By far the biggest task when creating Vorunthaal was the development of Area 2: The Underwater Ruins. 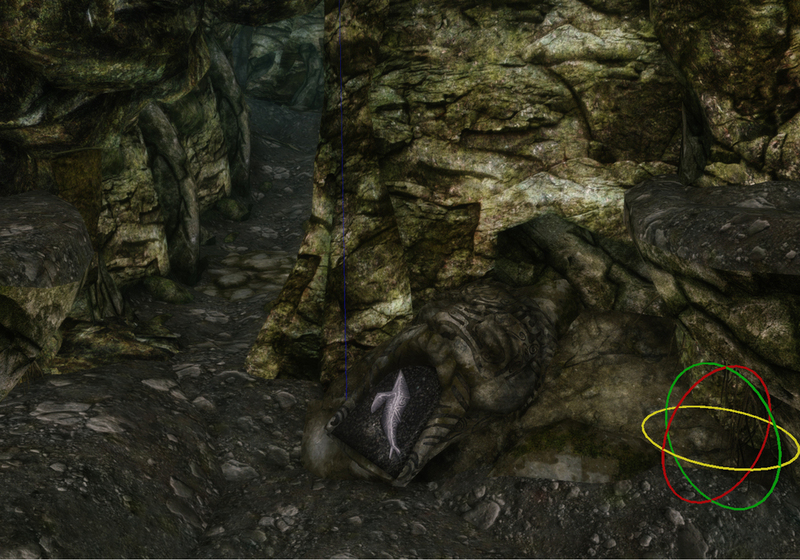 This area contained a large amount of objects, enemies and effects. 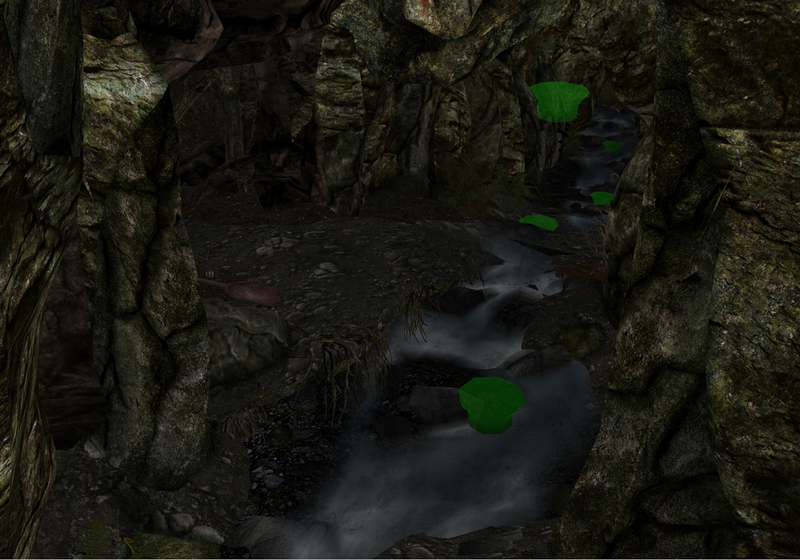 Even early within the development process I worked a lot on the waterfall. It was a set piece that needed to leave players in awe. The underwater exploration area provided an interesting challenge as the modular pieces couldn't give me the feeling that I wanted. As a result, much of it was built from hand placed rocks and pillars. At the exit to the underwater exploration area I placed a broken 'whale' puzzle pillar. 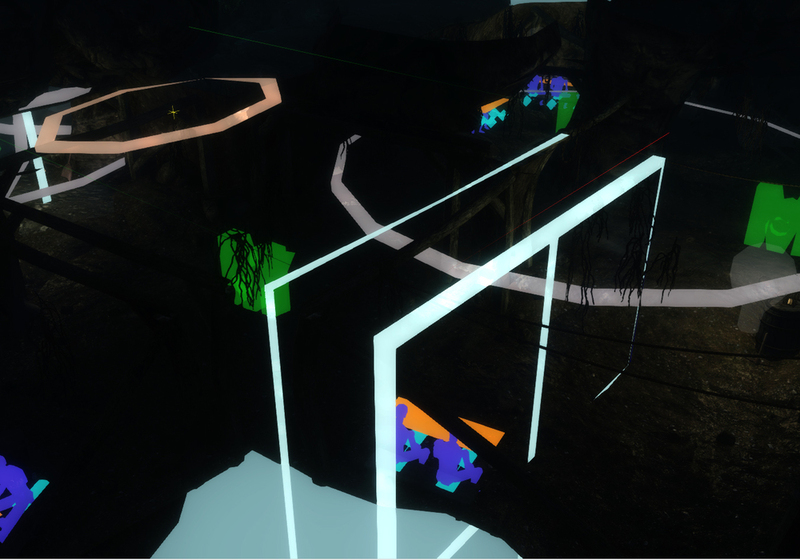 This served a dual purpose, it created a visual marker to draw the player's attention and it primed them for the solution to the upcoming underwater puzzle. The next area blocked out was the puzzle section. This puzzle requires the players to align three submerged puzzle pillars to the whale symbol. This period of slower pacing also gave me a chance to add some visual narrative elements to the level that would introduce the undead enemies. 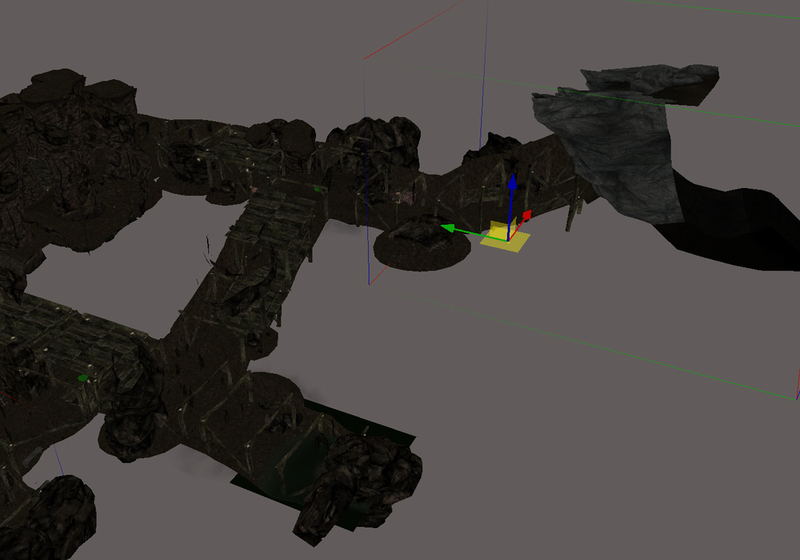 The last section of the level structure I worked on was Area 3: Collapsed Ruins. This area contained multiple encounters with the undead and many traps. 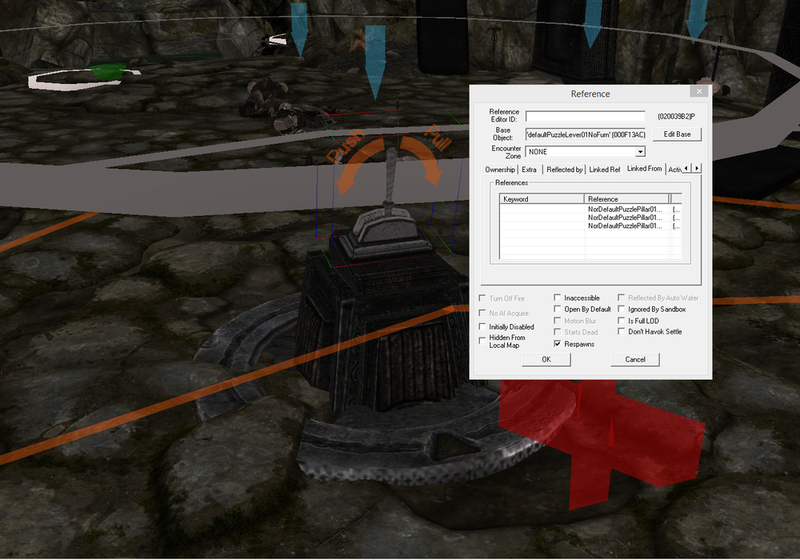 Once the level structure was completely blocked out the next step was to set up the links and events. Firstly, I worked on making the puzzle section functional. Each puzzle pillar needed to be linked to the appropriate lever and set to a starting rotation. One pillar started in the correct position of 'whale', acting as a visual cue for players to remember the priming whale pillar placed at the exit to Area 2: The Underwater Ruins. The traps were set up using trigger events and floor switches. 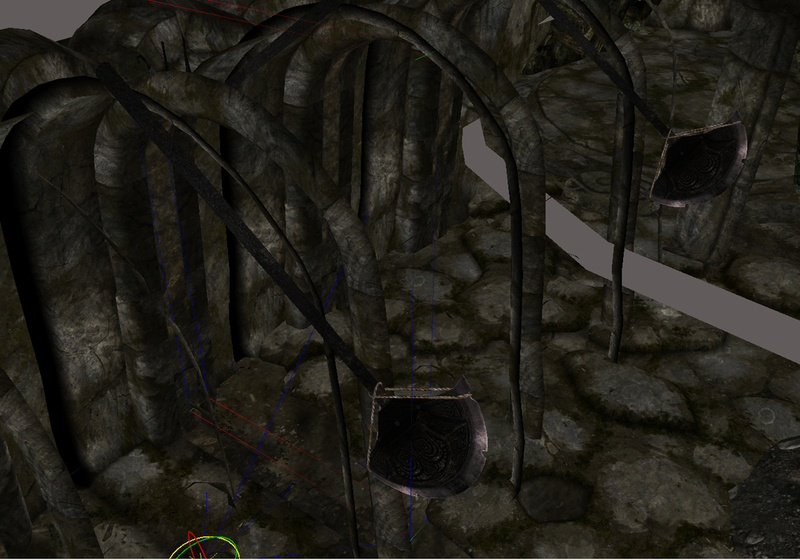 The aim was to get all the gameplay spaces functional so that I could play through the bare bones level. This would allow for some informed tweaks to be made. Lastly, the lock and key lever section at the end of the level was hooked up. This required the player to backtrack through one combat room three times, slowly encountering more powerful enemies. With the level structure blocked out, and functionally playable, it was time to go back and properly tweak the enemy encounters. I started in the mines, where I added quite a few easy enemies. With these enemies level started with a bang, but not with high difficulty. After the confined spaces of the mines, the encounter design in the large underwater ruins mixes things up by adding in ranged enemies. The player can also choose how to approach this encounter in many different ways; sneak up on the archer and steal his bow, take him out from a distance, swim through the water, or just charge in! After the underwater puzzle the undead enemies are introduced in a dramatic ambush. 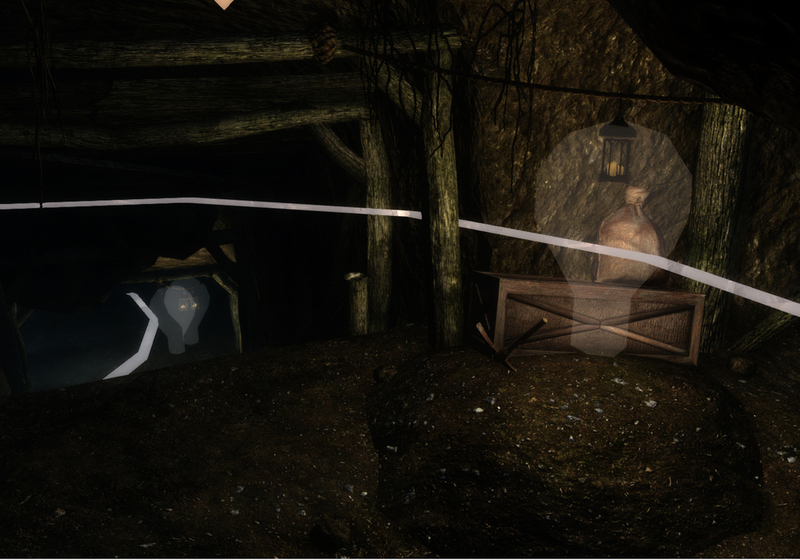 As the player walks through the open doorway here, the coffin lid pops-off revealing a strong foe. This entrance required a few triggers and links. This room requires the player to pass through it multiple times to complete the level. Each successive time, more coffins open up providing a small combat challenges. This room was one of the most tweaked encounters, requiring multiple passes to get right. The last encounter in the level mixes things up yet again with some verticality. As the player enters the chamber an undead magician spawns on the opposite ledge. This usually produces an interesting fight as the AI stays up on the high ground and players must trek through the lower section of the room. 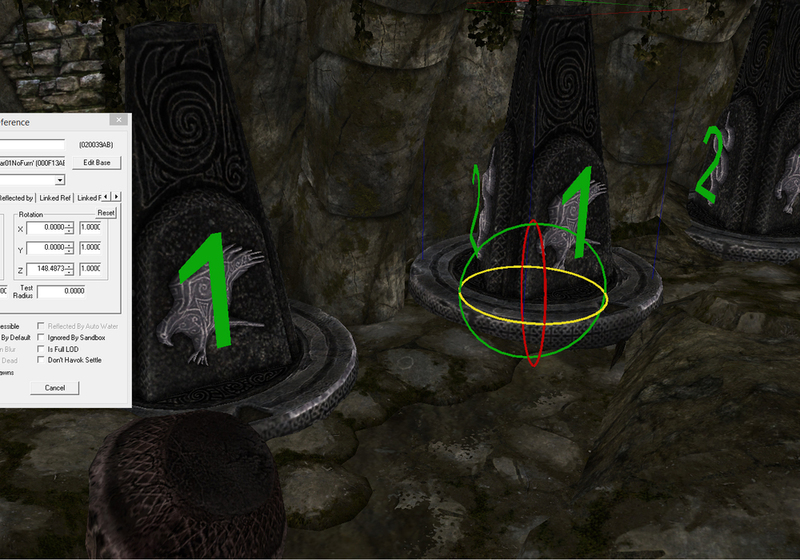 Alternatively, players can use one of their shout abilities here to skip over the lower section. With most of the gameplay and structure locked down, I added in some narrative elements to the level in the form of letters and journals that the player can find. To further guide players towards the underwater exploration area a journal was added to the bandit leader, and he was given a special name. I also added plenty of visual storytelling to the level by giving bandits places to cook food, patrol, or just sit down and take a rest. I preferred to leave some of the rules loose as to when these actions occurred, to make sure every player had their own unique story to tell to their friends. Loot and small objects were placed across the level. I tried to keep them varied and interesting, some lock boxes, some hidden stashes, some straight rewards. When placing loot some additional traps where added where I felt there wasn't already a good balance of risk/reward. Flame jets worked really well for many of these circumstances. When lighting Vorunthaal, I wanted to reinforce the visual progression of the level by setting different moods for each section. In the mines the lighting is deliberately kept warm and earthy. As the player moves into the underwater ruins the lighting shifts to a cool blue, changing the mood. This blue matches the eye color of the undead enemies. Glowing mushrooms were used to provide context for the blue lighting later in the level, and gave players with the alchemy skill an additional objective. Finalising the cave section was a large task, the roof was one of the most difficult parts of the level to get "right" visually. 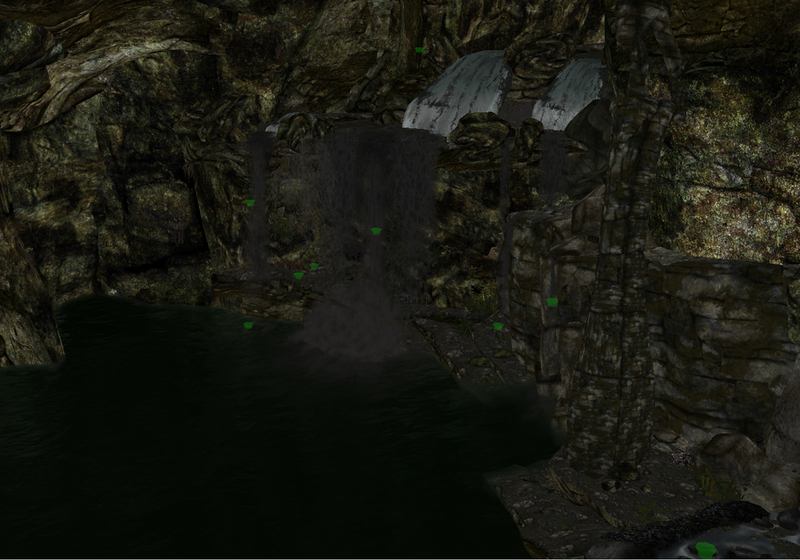 Effects and sound triggers were added to the waterfall in spades, to make it sing. I was really satisfied with the results, and with all the additions it was a worthy level centrepiece. Adding dust fall triggers and effects to the mines really helped to set this area apart visually. Ground fog was used universially across the level to tie all the areas together and add atmosphere. 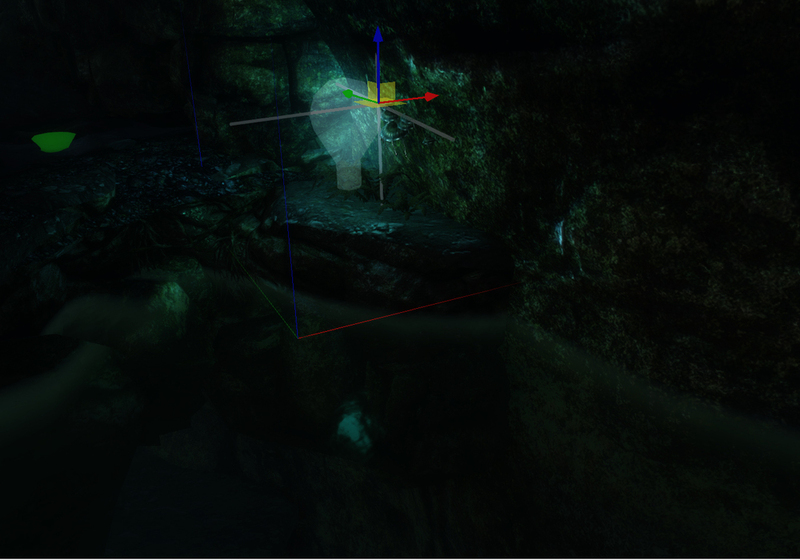 Lastly, I added light shafts to the underwater ruins and tweaked the post processing/color correction.